A piercingly raw debut story collection from a young writer with an explosive voice; a treacherously surreal, and, at times, heartbreakingly satirical look at what it’s like to be young and black in America. 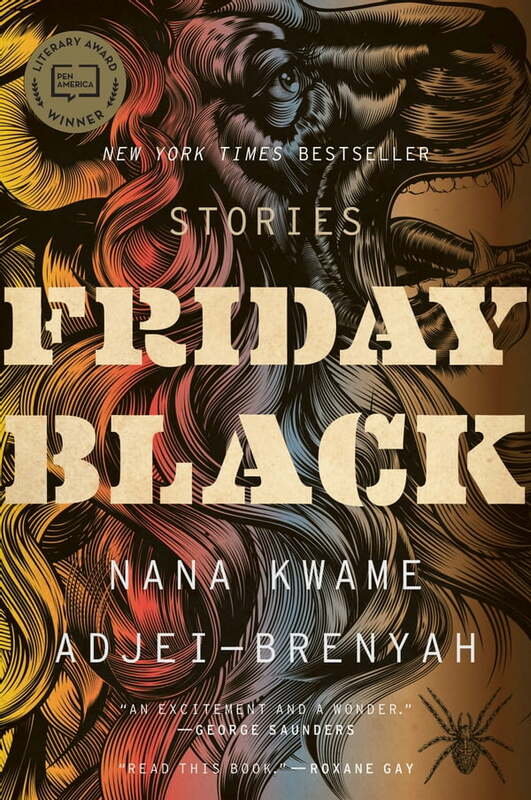 From the start of this extraordinary debut, Nana Kwame Adjei-Brenyah’s writing will grab you, haunt you, enrage and invigorate you. By placing ordinary characters in extraordinary situations, Adjei-Brenyah reveals the violence, injustice, and painful absurdities that black men and women contend with every day in this country. These stories tackle urgent instances of racism and cultural unrest, and explore the many ways we fight for humanity in an unforgiving world. In “The Finkelstein Five,” Adjei-Brenyah gives us an unforgettable reckoning of the brutal prejudice of our justice system. In “Zimmer Land,” we see a far-too-easy-to-believe imagining of racism as sport. And “Friday Black” and “How to Sell a Jacket as Told by Ice King” show the horrors of consumerism and the toll it takes on us all. Entirely fresh in its style and perspective, and sure to appeal to fans of Colson Whitehead, Marlon James, and George Saunders, Friday Black confronts readers with a complicated, insistent, wrenching chorus of emotions, the final note of which, remarkably, is hope.